The v-word - "virtual" - is a sticky wicket. We consider it a modern term, but its Latin roots go back to the 1400s, long before computers. Traditionally, it's a fairly ugly word, used to describe something that is like something else but isn't, such as the "virtual" extinction of a species or the "virtual" end of life as we know it. Even in its modern use applied to computer simulations of otherwise familiar activities, there is a general consensus that "virtual" means "not real." And this is the root of its veritable obsolescence. "Virtual" in computer terminology originally referred to simulated spaces within computers themselves known as "virtual memory." Virtual servers and memory have risen into the geek consciousness more significantly in the last five years, but virtual memory itself was in use on German Mainframes as far back as 1959. Thus, when this computing term was applied in the early 1970s to another computer-mediated space first suggested in works of fiction, "virtual reality," no one blinked an eye - even though this represented a fundamental shift in the application of the word. 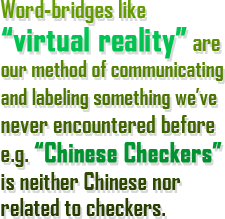 The beginning of "virtual" in computer terms was exactly its use in other areas of language - a concession to the noun's "not reality." If "virtual reality" were reality, it wouldn't need the adjective "virtual," and so by adding it we made the qualification: "OK, so we know it's not actually reality, but it's like reality." Word-bridges like this are our method of communicating and labeling something we've never encountered before. "Chinese Checkers" is neither Chinese nor related to checkers, but using that term allowed Bill and Jack Pressman to provide a familiar yet exotic context to a game that most Americans in the late 1920s found completely new. The problem, as Ray Kurzweil points out, is that even though most people with access to computers know what a "virtual world" is, we still use the bridge term, mostly out of habit. It now carries baggage beyond its original intent and entirely separate from its linguistic bridge function. "Virtual" itself is applied today more broadly than to online worlds, but the precise application of "virtual community" or "virtual file-hosting" only muddies the water further. The only commonality between those usages is a loose it's-done-on-the-computer abstraction, an imprecision that continues to frustrate philosophers today. But "virtual community" - which in the mainstream increasingly appears as "online community" due to its growing familiarity - leads to far less moral judgment than "virtual world," and this is at the heart of its need for replacement. As we continue to broaden the application of "virtual," from a computer networking term to colonoscopy via X-ray, the idea spaces that mediate between very real people are in much greater need of precise communication and understanding.